This ladder rack allows you to carry 1 ladder or other similarly shaped gear on the exterior side wall of your enclosed trailer. Keeps ladder within easy reach. Includes 2 brackets 2 towers, 4 bungee cords, and mounting hardware. Lowest Prices for the best trailer cargo organizers from Packem. 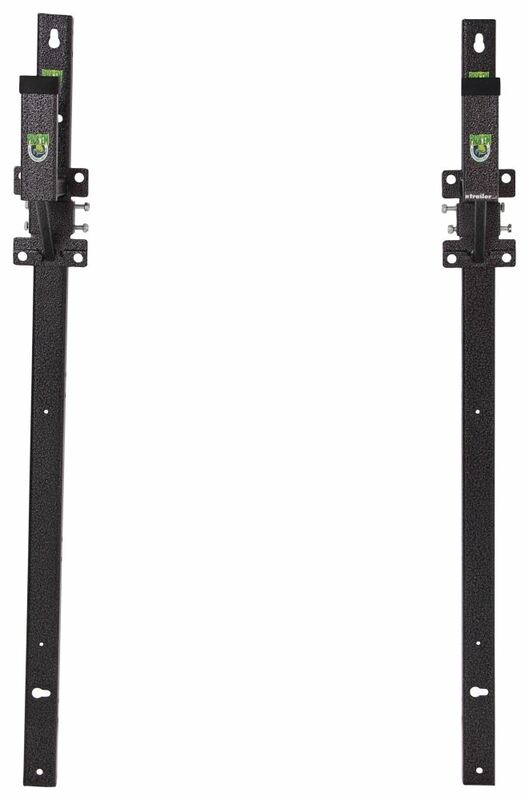 Pack'em Ladder Rack for Exterior Side Wall of Enclosed Trailer - Qty 1 part number PK-28WL-BM can be ordered online at etrailer.com or call 800-298-8924 for expert service. 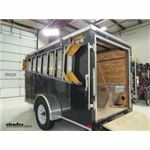 Today we're going to take a look at the Pack'Em ladder rack for exterior side wall of an enclosed trailer. This convenient rack will let you haul one ladder on the exterior side wall of your enclosed trailer. 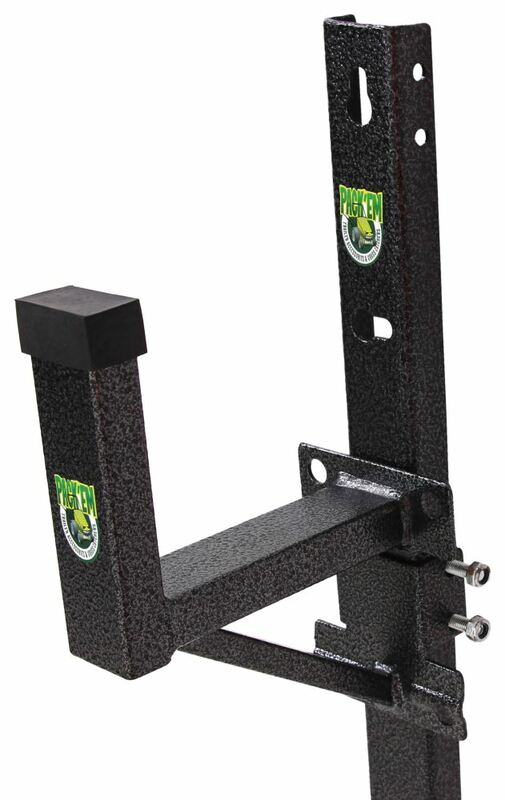 It eliminates the need for you to have to climb on top of your trailer to reach your ladder, and it can also be used to transport pipe, conduit, or similarly sized gear on your trailer. These brackets right here are all included on this part number. Now we do also sell additional brackets if you'd like. You can buy those separately if you wanted to add those on to carry a second ladder. These are Part Number PK-28WL, but this part number will come with everything shown here on the table. 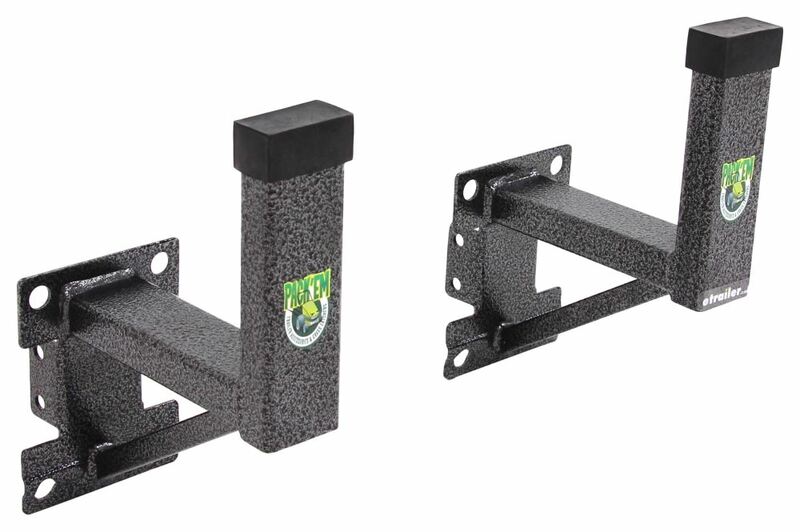 These adjustable brackets can be installed at varying heights on the towers. These are the towers right here. They can even be staggered for level installation of any oddly shaped ladders. These towers are what will mount onto your wall of your trailer and then these ladder racks, you can see it would be put on there, mounted on there. 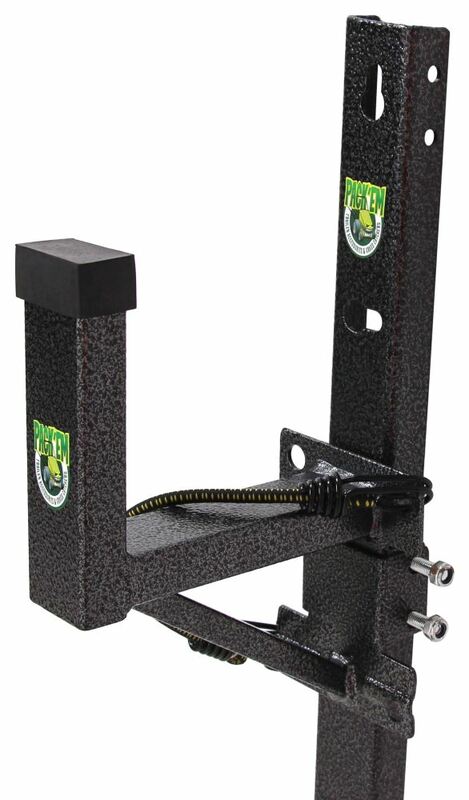 These towers are pre-drilled, so they install very easily on your enclosed trailer. On the ladder rack itself, if you notice, it has this nice welded gusset underneath to give extra support to the ladder rack. It will also provide a nice anchor point for a lock and a chain, which is not included, to secure our ladder or your items to your rack. These are made of a sturdy steel construction. They do have a nice gray powder coat finish to help resist rust. They do have a unique hammered pattern to them. It gives a nice touch to the outside of your trailer. This part includes everything shown here, the two brackets, the two towers, the four bungee cords and all the mounting hardware needed to install it. The application again, this will fit ladders up to 6-1/4 inches wide. The towers themselves, the overall height is going to be 46-3/4 inches. The weight capacity is 75 pounds. That should do it for the review on the Pack'Em ladder rack for exterior side wall of an enclosed trailer. 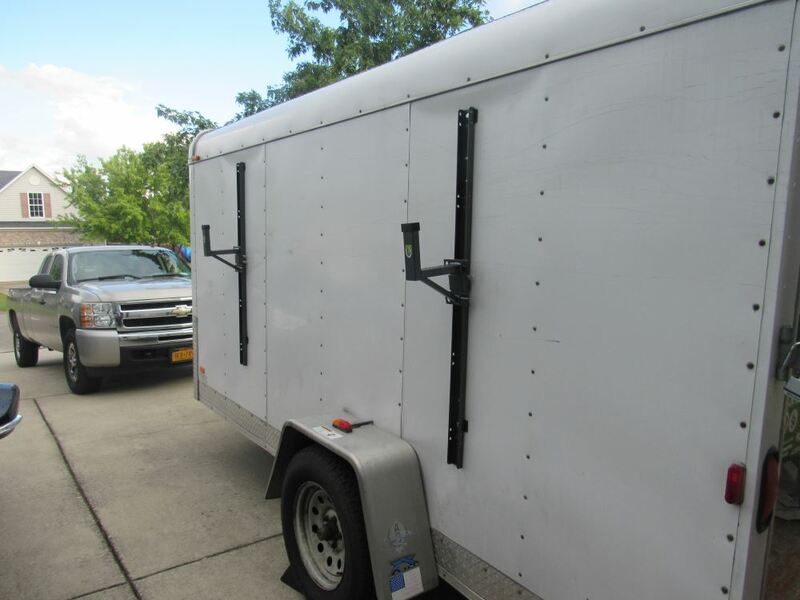 Order: RelevanceNewestRating - High to LowRating - Low to High This ladder rack allows you to carry 1 ladder or other similarly shaped gear on the exterior side wall of your enclosed trailer. Keeps ladder within easy reach. Includes 2 brackets 2 towers, 4 bungee cords, and mounting hardware. 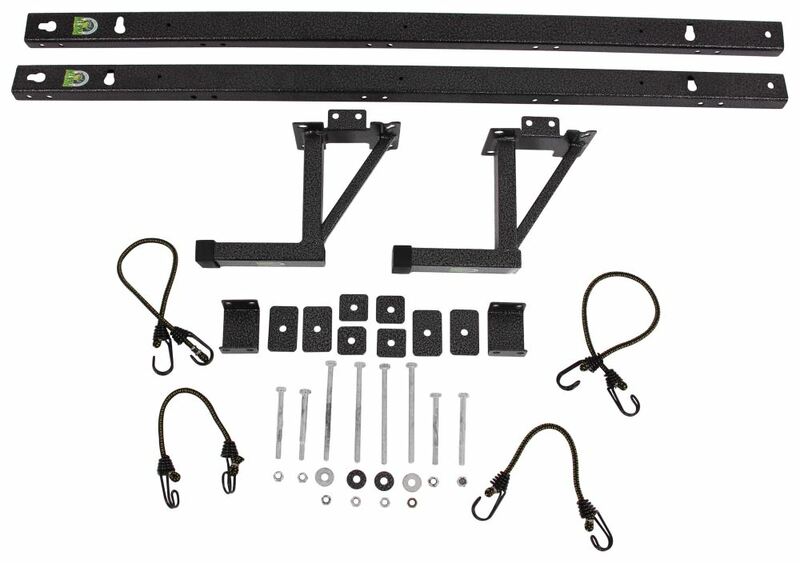 Although the description says the Pack'Em Ladder Rack for Exterior Side Wall of Enclosed Trailer, part # PK-28WL-BM says it is for enclosed trailers, it can be mounted on the inside if you wish. 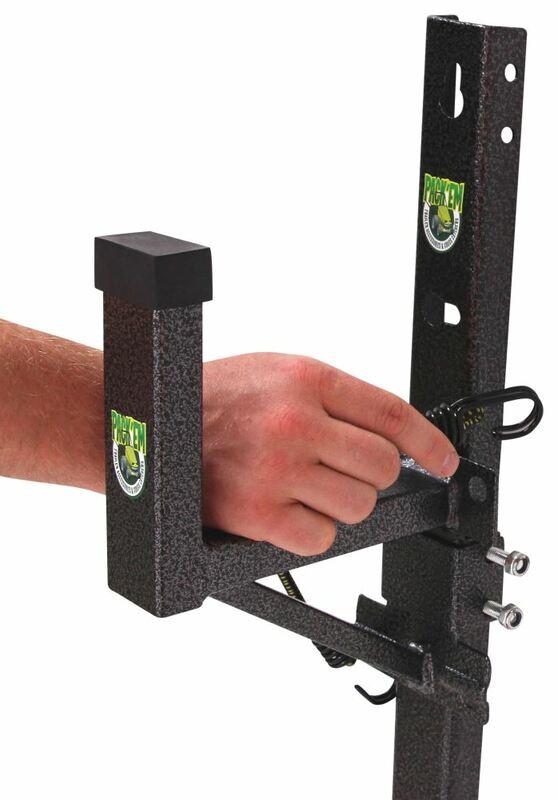 The upright beams that the ladder hooks are attached to measure 46-1/2 inches end to end so you will need to make sure you have sufficient room to install this system on the inside of your trailer. We sell a single ladder version of the rack you mentioned as part # PK-28WL-BM but it's the same height. That said there's no reason you couldn't cut down either version as needed. 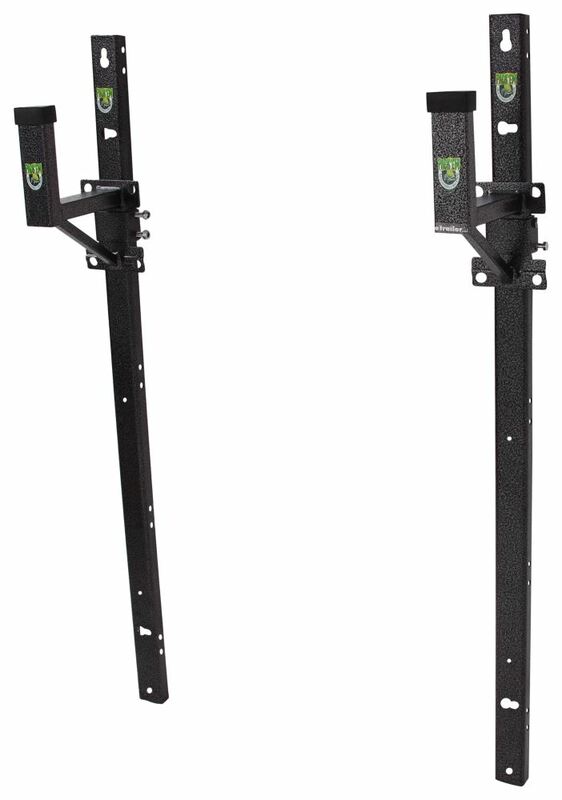 The overall length (height) of the PackEm Ladder Rack for Exterior Side Wall of Enclosed Trailer # PK-28WL2-BM and # PK-28WL-BM is 46-3/4 inches.